I just want to get back into the story, like I always do. [Saturday, Nov. 18] Yesterday, after I sadly and reluctantly left Tenterden, was the most nightmarish of the days yet. I caught the bus to Hastings via a transfer in Rolvenden. A crazy character with a tumor sticking out of his neck, and smoking one cigarette after another, ranted a bit to me at the bus stop. After arrival in Hastings, I never saw him again. Hastings is a bustling coastal town, all jam-packed up to the sea, much like Brighton. I didn’t really like it. At the coach stop, I bought a ticket to Portsmouth and was told I’d have to wait until 4:30 for the next coach. It was a maddening wait, for I had arrived in Hastings at a quarter past noon. I walked down the street, thinking I’d sit by the sea, but felt anxiety that I’d miss a bus being too far from the departure spot. I wanted to travel that day, not wait around. I ended up stopping into a pub just down the road from the coach, on Queens Avenue. There I wrote postcards and put down pints of bitter. After a while an elderly couple sat down beside me and we chatted. It was a pleasant time and I got a few glances from the locals when they heard my American accent. Well, the couple left after extolling their imagined virtues [of] Disneyland, and I had another hour or two to kill. I alternated between the street and the pub. Finally, after 4:00, when I queried the bus driver, he told me there was no bus from Hastings to Portsmouth; I had to come up to London again and transfer to the Portsmouth bus. Arrgh! I was hungry, tired, and had to pee halfway through the journey. At London Victoria Coach Station I ate, double-checked schedules, and relieved myself. By 7:30, I was on the bus to Portsmouth wondering where I was going to be sleeping for the night. [Sunday, Nov. 19] I broke down when I reached Portsmouth Harbour, The Hard, and booked the first place I saw, right across the street. I was exhausted from a long, hard day. It’s symbolic that the place I stayed [at] was called The Hard. Anyway, it was 45 pounds for the night—the most expensive to date, and nothing special. But I was able to relax, clean up, watch Monty Python on the telly, and sleep in a very comfortable bed. Unfortunately I was psychically unprepared to completely relax, and had some trouble really sleeping. I left the hotel by 11am and caught the 11:20 ferry to Ryde. It was a lovely day, warm (I’d guess 50-60 degrees F). I took the local bus in Ryde to Newport and transferred in Newport to Freshwater. I trudged up the hill at Bedford Road to Farringford Hotel where I am now in a comfortable room (No. 5) for 18.50 a night with breakfast. I made some phone calls after I settled in here—and Mrs. Wright of Totland Bay (who I’d written to months ago) fixed me up with Cambridge Lodge just down the street for the next two nights at 15.50 per. Well, I’ll save a bit and after all I’ll be closer to Dimbola (right across the road). I walked around this afternoon and photographed Farringford, the Downs, and Dimbola (photo above right). The seagulls squawked overhead, the sky was overcast. I walked down by Dimbola and looked out toward Freshwater Bay. This evening the guests have gone and I’m the only one staying here. I walked upstairs to the Tennyson library, and the young porter showed me Room #1—the poet’s bedroom, with the bathroom a walk down two stairs connected—the one that was quite probably the one in which Mrs. Cameron took the famous photo of Nelly. [Monday, Nov. 21] This morning I transferred from Farringford to Cambridge Lodge, down the road, at a savings of 3 pounds a night. I had a good day today. I [ate] breakfast at Farringford and chatted with a nice couple in their late 40s or 50s—she German descent and he English. They wished me luck on the rest of my journey. At 10:00 I checked out of the hotel and walked down the back footpath to the entrance of Bedbury Lane. I got set up in my room and then went to Freshwater Town Centre. Everyone I met along the way was nice. I stopped in at a Travel Agent and booked a coach ticket from Southhampton to Bath on Wednesday at 1:00. I looked in the shops and got a new watchband at Reade’s. A lovely young brunette helped me with it. “You Ain’t Seen Nothing Yet” by BTO played over the speakers. I thought it odd at the time. I stopped into a pub called Buddy’s and had a ham & cheese sandwich and a bitter and listened to a few songs by Buddy Holly there: “Learning the Game” and “Think It Over.” At 1:30 I stopped back [at] the Freshwater Library to meet Dr. Brian Hinton, the librarian. 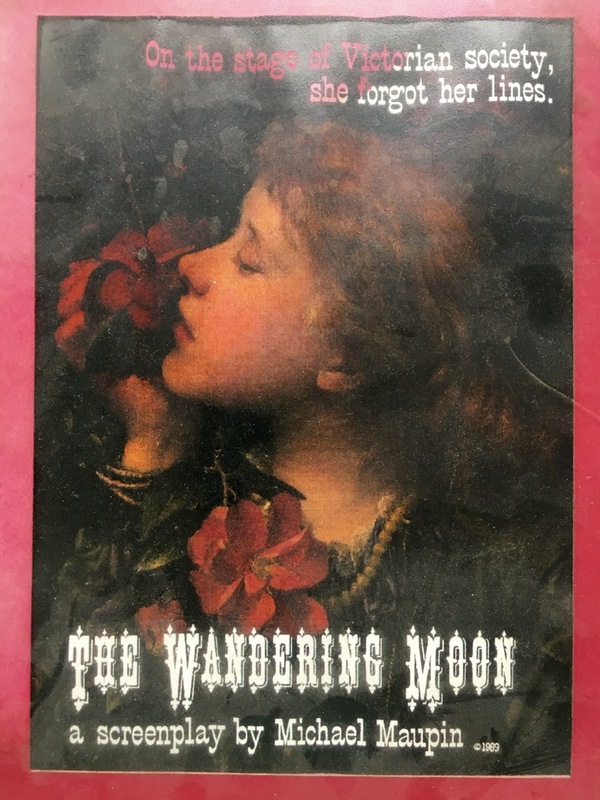 He looked like a British Wallace Shawn, youngish, late 30s, excitable, and we sat in the small library’s gallery where I showed him my draft of “The Wandering Moon”—he seemed pleased. He had just come from a Borough Council meeting about the fate of Dimbola. At Cambridge Lodge, I’m right across from it now. We didn’t chat long and at 4:30-5:00 I phoned Mr. R.J. Hutchings, a Tennyson scholar from Brighstone, at a phone box up the road. He’s picking me up here at 2:30 tomorrow to see my script. I had supper down at the Albion Hotel in Freshwater Bay after walking by the seafront and thinking about Everything. [Tuesday, Nov. 21] My last night at Cambridge Lodge, across the street from Dimbola. I was up before 8:00 for breakfast at 8:30 sharp. I caught the 9:23 bus into Yarmouth and walked about there—cashed some traveller’s checks, had a coffee, and photographed the pier. I knew I had the appointment with Mr. Hutchings at 2:30, so I struggled to make it back to Freshwater, returning by 11 o’clock at the Freshwater Library the copy of Virginia Woolf’s Freshwater: A Comedy that Dr. Hinton had loaned me. We chatted for a bit while he stamped people’s books. He’s an excitable fellow, a bit scatter-brained, but the local people think he’s brilliant. 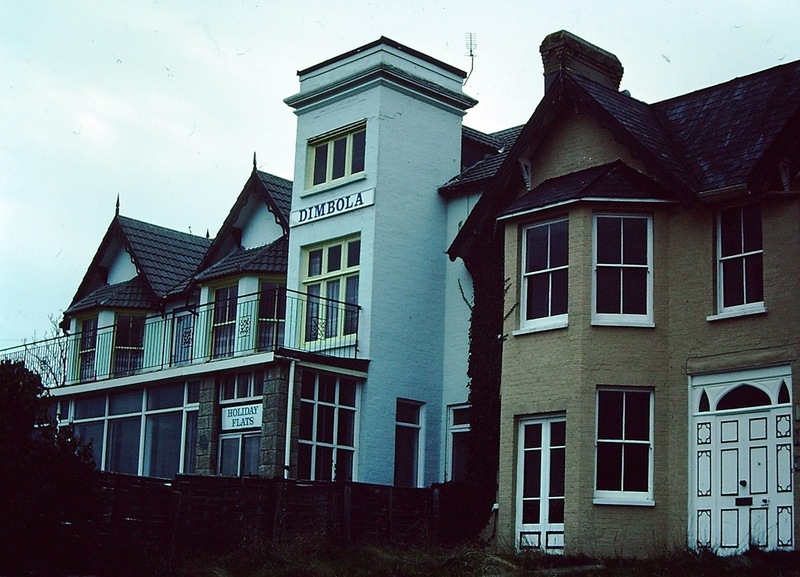 He’s gung-ho about preserving Cameron House on Freshwater Bay. After speaking to him at the library I walked back to Cambridge Lodge and waited a half hour for Mr. R.J. Hutchings, who showed up in a car with his wife. They are a couple in their 60s and were pleased to show me Watts’ old house in Freshwater, The Briary, as well as Moorlands Manor down the road toward Brighstone. I showed him the script and Mrs. Hutchings made tea. We talked somewhat haltingly about Watts, Tennyson, Freshwater, and the Camerons. He seemed somewhat pleased, but didn’t envy my task in rewriting and trying to sell the screenplay. He seemed to ask me a lot of questions about filmmaking I couldn’t answer. His wife drove me back to Freshwater Bay at around 5:00. I watched telly for a while and later had supper (Beef & Guinness pie, chips and peas) at the Albion Hotel. The college crowd came in [Mike, etc.] and Glaswegian Steve behind the bar was running about. Tomorrow early I leave for Cowes, Southhampton, and Bath before [returning to] London again. Let me just say “The Hard” never lasts. That’s a cliché, of course, but the takeaway is by enduring difficulty, seeing it through, I got to a better place in the end. There would be more strange things on the road ahead, but after the diversion back to London, and finally reaching Portsmouth, I knew I could soldier on. 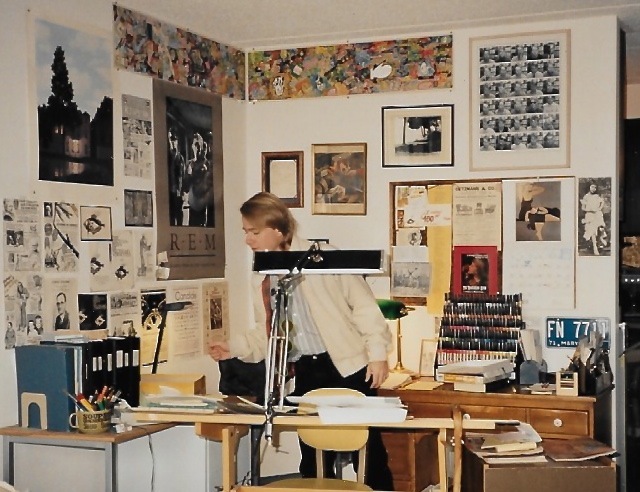 The other takeaway is recalling I was completely immersed in a new world, one I never would’ve imagined existed, and would never have had been a part of, had I not laid the groundwork months before (pictured at left in my Hopkins studio apartment work area in 1989). Just looking at that photo (taken by my maternal grandfather on a visit), confirms what my late father always said to me: “Mike is a pack rat. He makes his nest. He most feels at home when he’s like Thoreau in his Walden cabin.” I can’t confirm this statement (yet), since Dad is gone. But I’m still grateful he told me that. That pack rat nest is where I produced a lot of work, and where I developed my work ethic. Is it my best self? ~ by completelyinthedark on March 4, 2018.